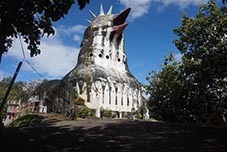 While the locals have dubbed it the Chicken Church (and it’s easy to see why), the name is a bit of a misnomer since the visionary behind the crumbling chapel meant it to look like a dove. 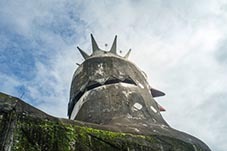 The man behind the weird structure was 67-year-old Daniel Alamsjah, who received a holy vision that inspired him to create the dove church. 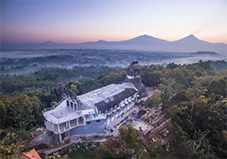 He picked a forested hill near Magelang to build his pious tribute, and created possibly the most bird-like building in the world, complete with giant, squawking head, and ornate decorative tail feathers. The prayer house opened its doors (or spread its wings, so to speak) by the 1990s. 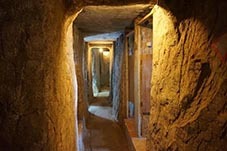 The church welcomed any religions that wanted to make the trek, including Buddhists, Muslims, and Christians, holding services in the upper floors, while the lower floors provided rehab and juvenile outreach, among other charitable services. 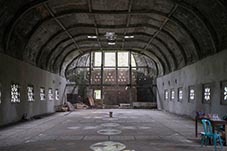 Unfortunately the project was grounded in 2000 when further construction costs became too unreachable and the poor chicken-dove-church was vacated, and left to the forest. Gereja Ayam continued to rot over the years, becoming a bit more ghoulish (in an avian way), with each year. These days it’s been cleaned up and turned into a proper tourist attraction if you can get up the steep hill. You can even climb up to the top of the head for amazing 360-degree views. 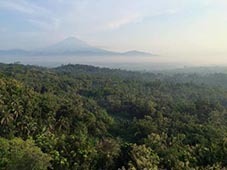 Church is open everyday and is often part of the nearby Borobodur Temple tour; there is a small entry fee.